I remember the day in 1999 when I first saw a color shift paint job. Everyone went crazy over it. I believe then it was $32 an ounce to buy…crazy right? 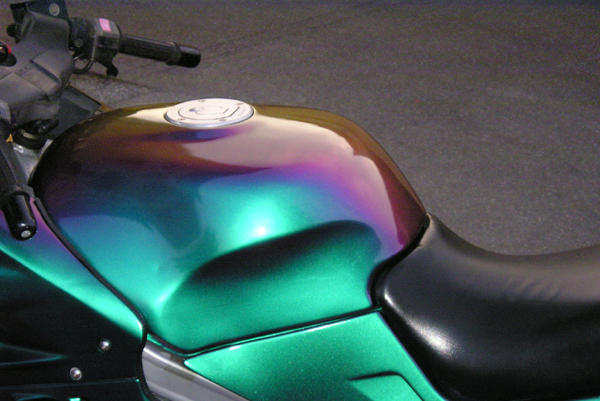 Todays custom finishes have evolved further and more and more these colors are finding their way into OEM formulations. Color is the number one highest material cost that body shops encounter and yet we focus on everything but that! I need a cheaper clear, cheaper tape, cheaper razor blades or cheaper sandpaper. Color is 30-35% of what you buy. Control color cost and you are well on the way to solid profitability on materials. Specialty pigments are popping up everywhere and if you don’t charge for them you will loose a lot of money. Most of the paint companies have quick reference guides available that will help identify these colors containing specialty pigments. Pay close attention and you will see what we are talking about here. Why do we pick colors in the paint shop? Why not do it when we write the estimate? Ive seen jobs that $30 an hour wouldn’t even cover the cost for the color, much less the rest of the paint and materials…Create a simple repair order invoice and the problem is solved. Forget specialty colors for a minute…why do we edge parts with the “Prime/Standard” mix? Why not pick the variant and mix the right color to begin with? Chances are we throw away enough product to paint the whole part because we got in a hurry to edge a part for a body man to hang. Why is it so hard to mix paint once for a job? Waste paint is ok because it will get used eventually right? WRONG. It will sit in huge fire cabinets forever and just wait to be dumped out. What’s wrong with dumping waste paint into similar color gallon cans and using it “base up” with? If you use every drop of color you mix, you will be well on your way to controlling your expenses.